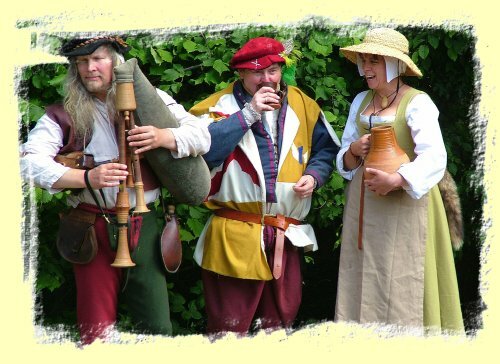 We play music from the reign of Elizabeth I which saw, amongst other things, the threat from the Spanish Armada and the rise of William Shakespeare. This is one of our favourite periods, not least because Peg gets to make, and we wear, some very tall hats. 2019 is 500 years since the birth of a very influential Elizabethan character, one Thomas Gresham. He was the person responsible for setting up the Royal Exchange which helped to fund many voyages of discovery, finding and claiming New Worlds and making exotic foods more readily available. It was one of the first steps in the creation of the British Empire. His fleet of ships carried his emblem, the grasshopper, as does the Royal Exchange to this day. 2020 celebrates 500 years since one of the true spectacles of the age, The Field of Cloth of Gold, where Henry VIII and Francis I of France met in the then English Pale of Calais. It was entertainment of the grandest order, theatrical sets, a great tournament, music, feasting, fountains of wine. . . . . . . . . . . . . . . . . . . . . . . . . . . . . . . . . . . . . . . . . . . . . . oh, and a bit of politics. 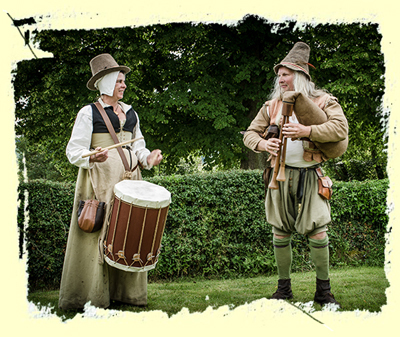 We have evolving costumes and music as the Tudor age unfolds, covering from the first Tudor, Henry VII, onto Henry VIII, Edward, Mary and finally Elizabeth. Vying with Elizabeth, as the most famous of these, is Henry VIII. Although he changed the very structure of England he is largely famed for his latter size, 6 wives and a despotic attitude to lives of others. He is not so famous for owning, according to his deathbed inventory (along with many, many other instruments), 5 sets of ivory bagpipes! Shame they didn't survive!! 2020 also celebrates 400 years since the voyage of the Mayflower, the ship that carried the Pilgrim Fathers from Plymouth to the New World. From the uniting of the British thrones under James I through to the Commonwealth under Cromwell and the English Civil War. Who would believe that in those puritanical times the first edition of John Playford's "The English Dancing Master" would be published. A period with such a wealth of music. 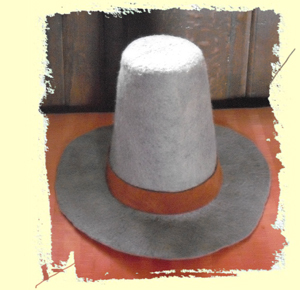 . . . . . . . . . . . . . . . . . . . . . . . . . . . . . . oh and great hats too! 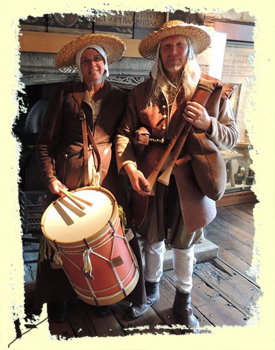 Myal and Peg are "Living Historians" who specialise in the life and music of the common folk of the 13th to 17th centuries. 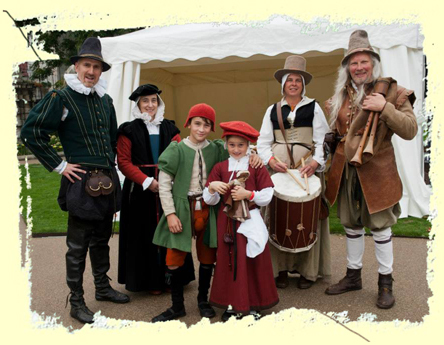 We work in historical venues, schools, at banquets, parties and weddings, bringing the sounds and atmosphere of the Medieval and Renaissance periods to life. Myal plays period bagpipes made by himself and based on examples found, as carvings in churches, right across England and Wales. Peg accompanies him on the drum. Together they create a big, loud sound which is particularly well suited to outdoors where the sound carries and gives an auditory backdrop to the rest of the event, obscuring the noise of the 21st Century and helping to create the ambience of another era. Received via English Heritage after an event at Pendennis Castle, Cornwall. And, after all, that's what this music is all about, music to dance to! 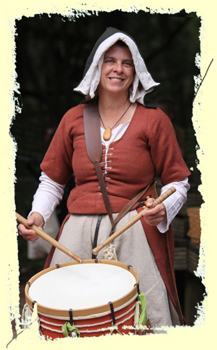 We also work with other re-enactors so should your requirements not immediately appear to be catered for within these pages please contact us as we know many good people with interesting and varied skills. Mark Harper has been a re-enactor working with the public and school children since 1993. Previous to that, and to the present, he has worked within the field of music and the music industry. From the mid to late 90s he performed as part of the duo “Two Little Boys” who took their raucous brand of foot tapping folk all over the UK and Germany, finally parting company after a near fatal accident in that country seeing Mark in hospital for 6 months. Although on his return to the UK, in 2000, he was straight out gigging, by the mid “Noughties” he found that he was being drawn more and more to the bagpipes as the instrument most likely to express his "art". 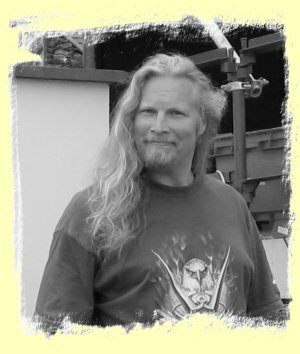 As well as playing Mark is a sound technician, engineering the sound for a couple of bands that he has worked with for many a year. 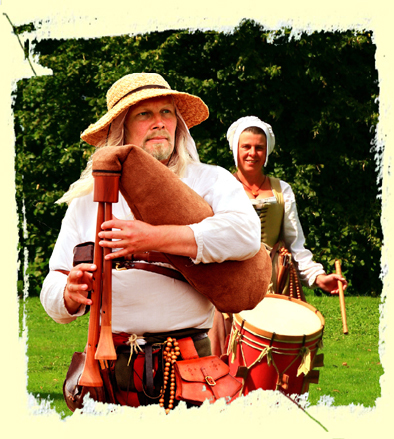 As a historical interpreter or re-enactor he still has a close association with the country's foremost recreation of Tudor life at Kentwell Hall, in Suffolk. When not making music, Mark might be found making other stuff, including musical instruments. 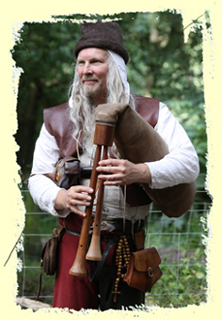 He has made harps, lyres, fiddles, medieval trumpets (buisines) and of course, bagpipes. 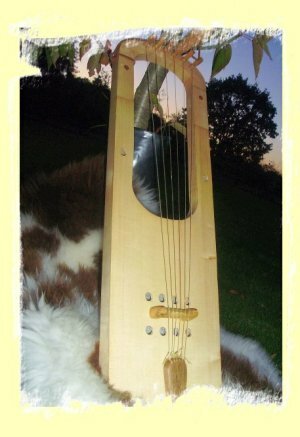 He was commissioned to make a lyre (right) for the Anglo Saxon Village Museum at West Stow in Suffolk. He has also made many of the trappings to demonstrate his and Peg's living history and no one who knows Mark would forget to mention that he is a maker of the finest beer.